Programmers and software engineers will always use the latest development environments, the trendiest frameworks, and languages they learned only 21 days ago. What if this weren’t the case? What if developers put care into their craft and wrote programs with an old world charm? What if Windows executables were made with the same patience as artisanal firewood, or free range granola? [Steve] has done it. He’s forging a path into the wilds of truly hand crafted executables. The simplest executable you could run on a Windows box is just a simple .COM file. This is an extremely simple file format that just contains code and data loaded into 0100h, and a jump to another point in the code. The DOS .EXE file format is slightly more complicated, but not by much. [Steve]’s goal was to build a proper Windows executable without a compiler, assembler, linker, or anything else. Since most of us are long past the days of hardware serial ports, the USB to serial adapter has become a mainstay on the hacker’s tool belt. While they’re cheap and convenient, USB to serial adapters aren’t always the easiest thing to use: there’s always the issue of what COM port Windows is calling your USB to serial adapter, or what TTY device it is in Linux/OS X. [Avishay] has a very, very cool solution to this problem: put a display on a USB to serial converter to tell the user what COM port the OS labeled it as. 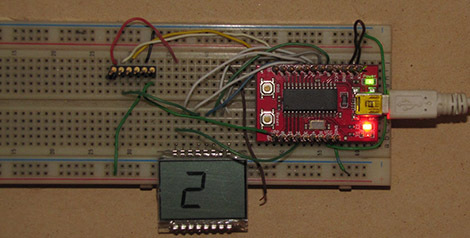 The prototype runs on a PIC 18F2553 dev board. When plugged into a Windows box, the serial adapter sets up two USB devices. The first device is a Communications Device Class that handles the grunt work of the USB to Serial connection. The second USB device is a proprietary piece of software that grabs the current COM port number. This number is displayed on an LCD thanks to a host application on the Windows PC that reports the COM port of the Serial adapter. It’s one of those ideas where you didn’t know you needed it until it was presented to you. An excellent tool from [Avishay], although maybe a pair of 7-segment LEDs would make it a more manufacturable device.